Blend on high until smooth, using the tamper to push ingredients into the blades. You will hear the motor noise change to a more consistent low-pitched growl once it is ready (it usually takes about 1 minute). If you want a maximally smooth nut butter, after you hear this noise, you can leave the tamper all the way down in the middle and let the motor run for an extra 5–10 seconds. I’ve heard that some almonds won’t blend into a smooth nut butter, even if they are roasted. If your almonds are not forming a butter, you can add a few tablespoons of oil, or about half of a cup of roasted high-oil nuts, such as pecans. If you blend less than these amounts, the tamper becomes ineffective, because there isn’t a sufficient amount of ingredients to push into the blades. It is possible to blend less, but you will likely have to periodically stop and use a spatula to scrape down the ingredients from the sides of the container. If you blend more than these amounts, you increase the risk of overheating the motor. Water will cause your blend to clump up and not blend to a smooth consistency. Make sure the container, lid, and tamper are all dry. Also, do not blend with honey or other ingredients that contain water. 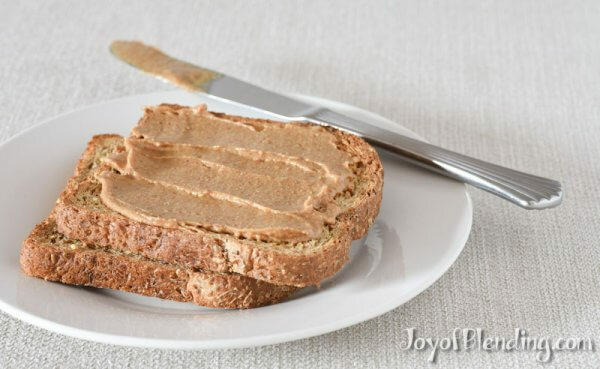 You can gently mix in such ingredients once you’ve made the nut butter. Blend at maximum speed and use the tamper to push ingredients into blades. I focus on pushing each corner of the blend down. Don’t be afraid of the loud sounds. You’ll hear a low-pitched growl when the motor is working hard against the thick butter, and a high-pitched whine when the blades form an air pocket and are spinning freely. Both of these sounds are normal. I made a video to show how I use the tamper and so you can hear the sounds for yourself (see above). The first few times you blend something thick with a new Vitamix you will likely smell something that smells like burning. That is the coating on the motor windings “curing,” and it should go away once the motor gets broken-in. Later you’ll only smell the motor if you get close to overheating it. The motor has a thermal cutoff that will turn it off before it burns out. If you set off the thermal cutoff, you have to wait 30–60 minutes for the motor to cool before you can use it again. Use a long, narrow, and rigid silicone spatula to ease scraping out the container. I like this one, because it matches the contour of the bottom of the container (especially for C-Series containers). At the end of the video, you can see how I scrape out the bottom in a counter-clockwise direction. This way the spatula is against the duller side of the blades, so the blades don’t gouge it.) You can also not worry about scraping it all out, and then blend the remnants into a smoothie, nut milk, frappuccino, soup, or ice cream. To clean the container, blend hot soapy water at maximum speed for longer than you would usually for cleaning the container—about 1 minute. If you rinse and there’s still some stuck under the blades, add more hot soapy water and blend a second time—that’s always been sufficient in my experience. I usually use a soft soapy sponge to wipe down the upper walls of the container, since the violent vortex from the blades usually only fully cleans the bottom half of the container. Even though you make nut butter with dry ingredients, it works better in the “wet blade” containers than the “dry blade” container. This is because the goal in making nut butter is to turn it into a thick liquid that circulates in the vortex formed by the blades. The wet blades are designed to form this vortex, which pulls ingredients down into the blades. The dry blades are designed to push ingredients up away from the blades, and they are primarily for making flours. How long does the almond butter keep? I keep it for a couple of weeks in the fridge. Mine turned out to be dryer. I have kept it in the frig for a month (sometimes longer) and it was still good to eat (meaning no one got sick from eating it). I am not a food health expert, so I’m only sharing my personal experience here. This is by no means a recommendation. What amount for Professional 750? If you use the container that comes with the Pro 750, that is the G-Series container I mention in the post, so use 4 cups of nuts. If you want to easily make smaller amounts, you can get a 32 or 48-oz container to use with your machine. 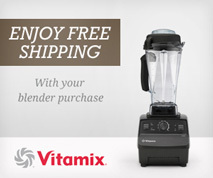 Thank you so much!…….you are a wealth of information….I always look forward to your emails…..I learn so much about my Vitamix from you. I am contemplating buying the dry container to make flour from garbanzo beans. Have you ever done this in the dry container? I love the video you made regarding the almond butter and the helpful tips. I did not notice if you used the second power switch or not? It looked so easy. I won’t be afraid to try it now with more confidence. I have not made flour from garbanzo beans, but I’ve seen it done. Since it’s a dry flour, it will work best in the dry container. And thank you for your comment about the second switch. You are absolutely right that I did not use it, but I should have clarified that my use was specific to the type of Vitamix in the video. On this type (G-Series), you get to maximum speed by just using the dial. (The left switch on this type of machine is a pulse switch, not a high-low switch.) But if you have a C-Series model, like the 5200 or similar, then you would turn up the knob, then flip the second switch to high. The 7500 is a G-Series model. In fact, it’s the model that I used in the video. However, in the video I used a 32-oz container with it. For anyone else wondering about which series a model is, you can check my comparison chart. The important thing here is what container you use. I was hoping that the little pictures of containers next to the recommended volumes would be helpful for figuring out what kind of container you have. I have been using “raw” almond without adding additional vegetable oil. My assumption was, roasted means dryer nuts and raw nuts have more oil. Now reading your post, I realize I have been wrong with my assumption all along, though I don’t understand why roasting makes it less dry. Anyway, this explains why my raw nut better turned out to be dryer than your roasted nut butter. Ha, there’s so much more to learn for me. Raw and dry-roasted nuts have the same total amount of oil…. It’s just that roasting breaks down some of the internal structure so that the oil becomes more accessible. Thank you. Always learn something useful at your site. Do you have any recommendations on the time and temp for home almond roasting (baking in the oven)? Also I’ve read it somewhere that roasting almond depletes some of the crucial nitrients, that’s why I don’t roast them. Sorry, I lost track of this question. I don’t worry about losing nutrients in roasting, but I’ve read that lower roasting temperatures can help for that. Got it, I’ll experiment with it. Thanks. The vitamix nut butter recipe in the book that came with my new Ascent machine says to make nut butter on power 7 instead of on high. Why do you recommend high instead? Other Vitamix cookbooks say to make it on high. I just looked up the Ascent cookbook, and I see what you are referring to. Note that it says to first run it on high for ~1 minute until the pitch changes before running it at 7 for 30 seconds. I do not know why they then say to reduce the speed. Honestly, I don’t think it will make much difference. Thinking about it, I now have an idea of why they say to reduce the speed to 7. This is going to get a bit into the weeds, but you asked, so here goes. The answer has to do with the speed control of the machines. (For a more in-depth explanation of this, check out my Vitamix speed post, which also includes some plots that may help visualize what I’m about to try to explain in words.) The first thing you need to understand is that the type of motor in Vitamix machines naturally slows as loads increase. Ascent Series (and G-Series) machines use a feedback control that attempts to maintain the rotation speed regardless of load. However, at the top speeds the motor maxes out, and the speed will decrease with load. One of the results of this is that on Ascent and G-Series models, when you blend something thick the top speed settings will all run the motor at the same speed. (You can test this yourself next time you have a thick blend—just adjust the speed and listen to the pitch of the machine.) So, now you may be wondering, if 7 spins the same speed as 10 for super thick blends, what difference does it make? The difference happens when an air pocket forms. The air pocket reduces the load, which allows the motor to spin faster. If the speed is set to 10, then the motor will spin faster in the air pocket than if it were set to 7. Spinning slower in the air pocket may allow the air pocket to collapse on its own, without requiring the tamper, and I believe that is why they recommend speed 7 for that stage of blending. C-Series models do not have the speed feedback control, so running a thick blend in one of those machines at speed 7 will make it run significantly slower, which is non-ideal. Thanks for your thoughts on this. Your idea seems plausible to me. In your instructions you say for the smoothest result to process for an extra 30 seconds with the tamper in the center. When I was making nut butter last night I tried this but it seems to block the vortex and interfere with the flow through the machine. Processing with nothing appears better. What is the reason for wanting the tamper in the center? In my experience, leaving the tamper in the middle can prevent the formation of an air pocket, while still allowing the blend to circulate. I can imagine that different blend volumes and/or thicknesses could make leaving the tamper in the middle less effective. (Thickness will depend on temperature and the amount of oil in the nuts.) I would just stick with whatever works best for a given blend. So I am thinking a smaller amount of nut butter could be made in the ascent smoothie cup, perhaps using only 1 cup of nuts in the 20 oz cup versus 5 cups in the 64 oz container? Thus being able to use the nut butter up more frequently and having it fresh. Your thoughts on this?? Thank you for the dry vs wet blade clarification! I’m shocked that even Vitamix doesn’t mention this in their recipes. Just made hazelnut butter with dry roasted Trader Joe’s hazelnuts and it’s amazing – no idea why hazelnut butter isn’t sold in stores! Hazelnut butter sounds great! I haven’t tried making it, though I have made a simple nutella-like concoction by blending hazelnuts with chocolate. That machine is actually just as powerful all of the other full-size Vitamix machines, and it can definitely make nut butter. It comes with a container with 3″ blades, so nut butter will work best with 3-4 cups of nuts.